Michelin House is a 20th century property, constructed sometime after 1904, the plot being shown as the north-eastern corner of a large field on the 2nd Edition OS. On the tithe map the property lies in a sub-division of this field (named in the apportionment as 'Upper Field' owned by Sir Edward Kerrison) and is similarly marked and named by Skynner. 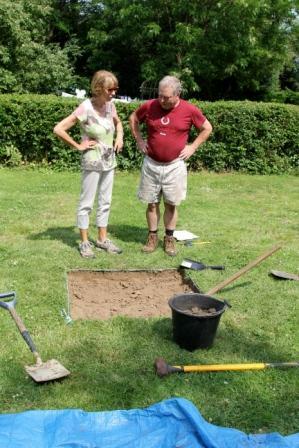 The test pit was placed c.9m to the north of the house at the centre of a flat lawn. A 0.2m thick modern topsoil, Context 1, overlaid 0.2m of a dense mid/dark brown clay/loam with occasional flints, Context 2. This lay above the natural clay subsoil. The house appears to lie just outside the area of settlement centred around Heckfield Green, being clearly marked as farmland on 18th and 19th century mapping. The test pit confirms this usage with Context 2 assumed to be the surviving post-medieval ploughsoil. Both contexts were noticeably devoid of any finds material, again implying the test pit was wholly separate to any areas of occupation.